I always get tickled when I get emails from friends about my posts. I just forgot to take any pictures of it. It's starting to get darker a bit earlier and I'm still learning how to take pictures so please bare with me. We have ceramic tile throughout our cottage and I love how easy it is to maintain. I just change the area rugs seasonally. Mr. Bill built it right before he and I moved out here. 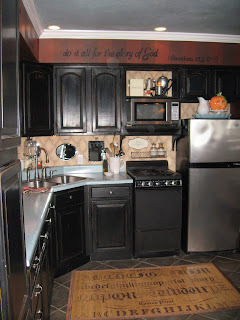 I painted and distressed all the cabinets and then decided to wall paper the interiors with several different wallpapers in Black and cream. The Countertop was also painted using a cool new product designed just for this application. 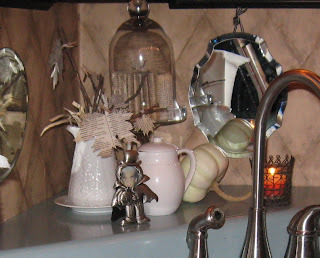 This little nook just above my kitchen sink is one of my favorite places to make a quick change. It only needed a few photos and now you've seen my cottage kitchen. The mirrors on my undercounter walls are really great for bouncing the light around the room. As you can see..They collect spots well too! WOW!! I love it! 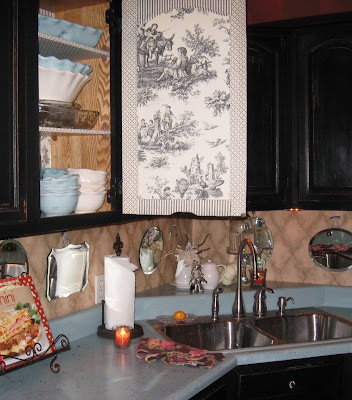 I have to ask -- did you paint your cabinets or did they come stained dark? I ask because I have cherry cabinets that I plan to paint and am unsure of how to do it. Any advice? Loved having a look! Thank you! Thankyou, Donna for coming by and for saying a prayer. I'm home waiting to find out what the dr. thinks is best. may be a long week. Love your kitchen and the black cabinets. It's really darling, even if it's small! And your blue island is awesome. love it! I love the black cabinets... they are scruptious. The rug is a must have for me, I will be on a hunt to find one. I hope your Tuesday is a great one. 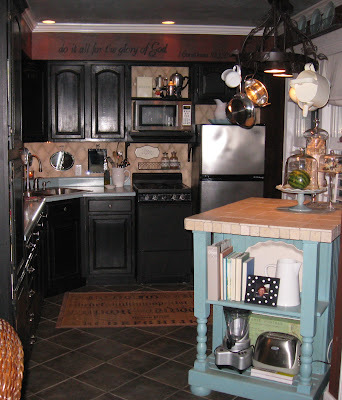 Adorable...what a great kitchen...love the black cabinets and the wallpaper inside...I may have to borrow that idea for my cabinets...please stop by my blog I have a surprise for you! Thanks for the sweet post on my blog...what a dear person you are! Fun kitchen! Love the splash of turquoise and the added detail of the wallpaper on the inside of the doors. Aren't you clever! Looks all the better when the hubby leaves the cupboard doors open. Just stumbled upon your scrumptious little blog and it's going in my favorites for sure! We are about 2/3 through painting our cabinets black so it was a fun surprise to see yours! Ours are also distressed but our base color is a robin egg blue so it was funny to see your blue dishes! I have some photos on my blog if you want to check it out!